Remarks: Karanis (1st BC to 5th C) was mainly a agricultural town which expanded in prosperity after Augustus conquered Egypt in the 1st century and well into the 2nd century. The archaeological site of Karanis was active from 1924 to 1935. The following pictures below shows details of this magnificent collection in Gallery 138. 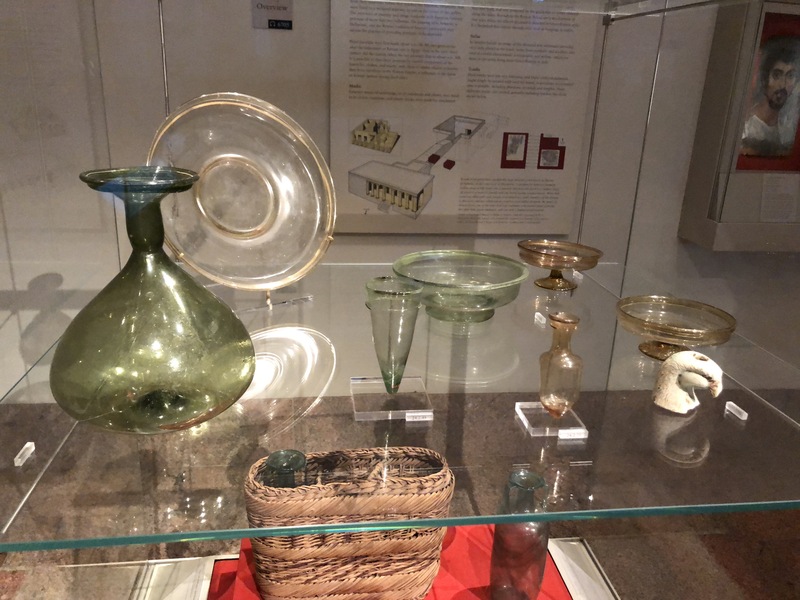 Most of this glass was manufactured during the 3rd-4th centuries. Additional glass at METROPOLITAN MUSEUM OF ART (NEW YORK). 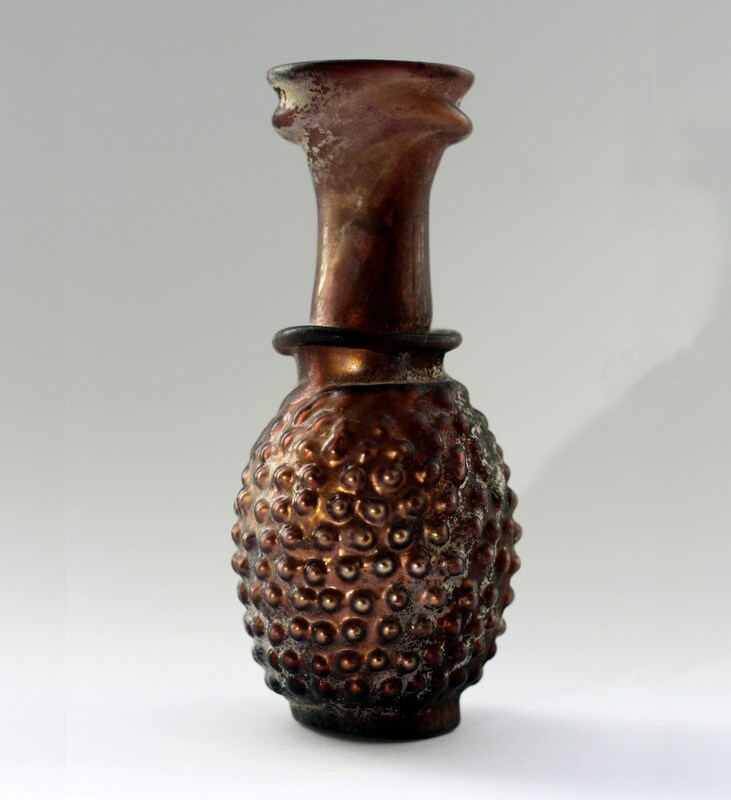 Description: The body of the (light) purple bottle is blown in a three-part mold . The two vertical seams are still visible. Eleven rows horizontally stylized grapes. The pattern is irregular. At the bottom remains of the pontil. The neck and mouth are free blown, and upon reheating the double edge near the rim became slumped. Remarks: This type of grapes bottles was mainly produced in yellow brown, bluish green, the purple color is less common. There are bottles with only rows of grapes, but also with on both sides a grape leaf (slightly earlier date than the first). And other types with one or two handles. 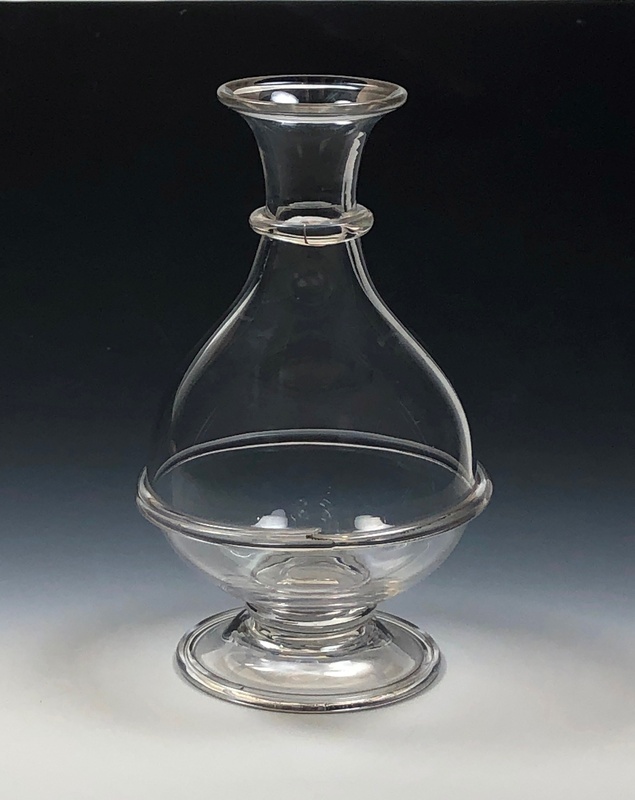 The function of this bottle is not entirely sure, probably it has been used as a small wine decanter on the table. Remarks:This is a palm size dish or bowl may have had a lid. 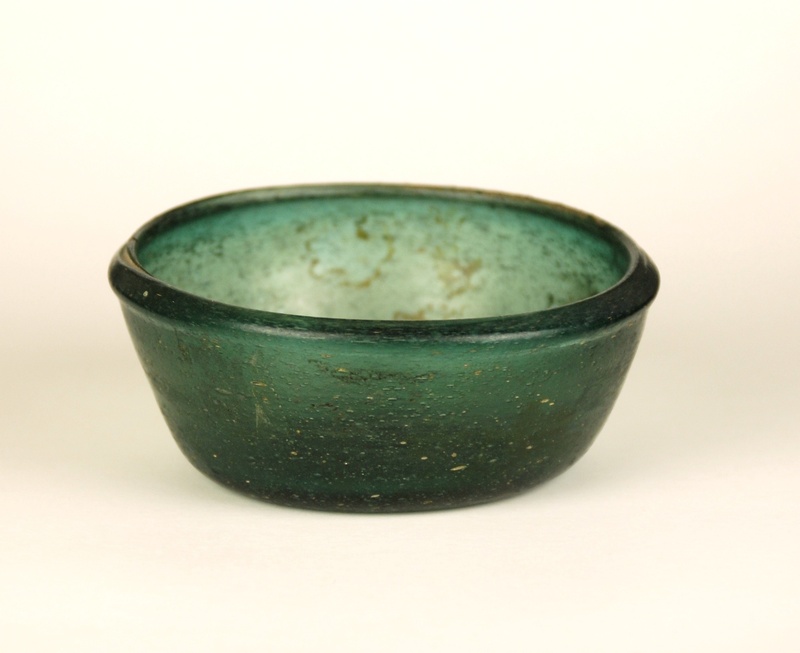 It is made of thickly blown dark green glass with many trapped air bubbles. It is late Roman or Islamic. 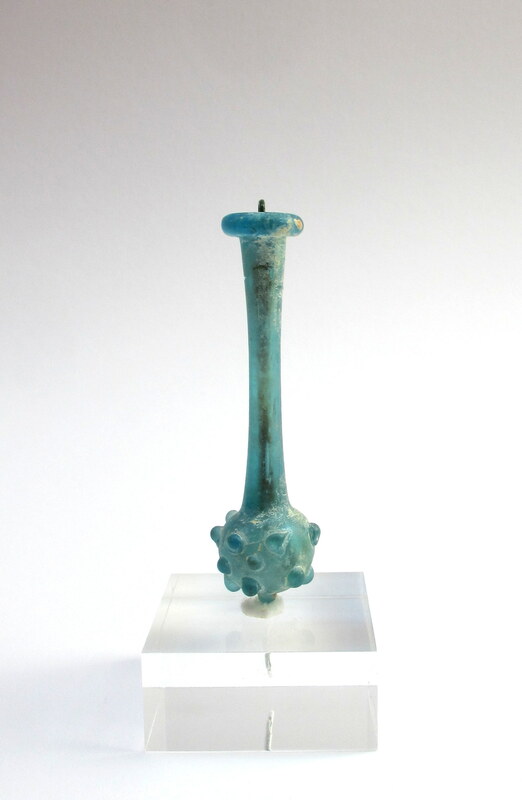 Description: Bluish green glass, globular body with 20 massive knobs, long cylindrical neck, extremely heavy and flattened rim, folded inward, small opening. Remarks: A bottle with a body decorated with knobs and shaped like Hercules’ Club is not only unique but exceedingly rare. It was a cool day with the threat of rain on at Pier 5 in Brooklyn Bridge Park. This didn’t dampen the excitement of the first kick off show of a four-month tour of the Glass Barge celebrating the 150th anniversary of the canal journey to bring glassmaking to Corning. Below are pre-show pictures of this event. For better pictures see the link from CMoG at the end of this post. Lucy (C.L. Churchill) the 1964 tugboat which will be pulling the barge four month tour. Additional information taken from The Corning Museum of Glass (CMoG) web site. The Corning Museum of Glass (CMoG) today launches GlassBarge through May 28 at One°15 Brooklyn Marina in Brooklyn Bridge Park, kicking off a four-month tour celebrating the 150th anniversary of the canal journey to bring glassmaking to Corning. GlassBarge is offering free public glassblowing demonstrations aboard a 30’ x 80’ canal barge specially equipped with the Museum’s patented all-electric glassmaking equipment. Following its debut in New York City, GlassBarge will then travel north on the Hudson River, and westward along the Erie Canal, stopping in Yonkers, Kingston, the Albany, Syracuse, and Rochester areas, and Buffalo, among other cities. A flotilla of historic ships will accompany GlassBarge throughout the summer, including the Lois McClure, a replica of an 1862 canal barge, and the C.L. Churchill, a 1964 tugboat, both part of the permanent collection of the Lake Champlain Maritime Museum. Educators from the Maritime Museum will also share the story of canal life in the 19th century and how materials were shipped on New York’s waterways. Throughout its voyage, GlassBarge is under the flag of the South Street Seaport Museum and will be accompanied by the Museum’s historic tug W.O. Decker on the Erie Canal. GlassBarge commemorates the 150th anniversary of the relocation of the Brooklyn Flint Glass Company—now known as Corning Incorporated—via the New York Waterways by canal barge to Corning, which would become a center for important artistic and technological innovations in glass. In addition to sharing the story of glassmaking in Corning, the recreation of the 1868 barge voyage emphasizes the continued role of New York’s waterways in shaping the state’s industry, culture, and community. GlassBarge is the 2018 signature event for the statewide celebration of the Erie Canal Bicentennial (2017-2025). GlassBarge will visit ports in Yonkers, Poughkeepsie, Kingston, Waterford, Little Falls, Sylvan Beach, Baldwinsville, Fairport, Lockport, Buffalo, Medina, Brockport, Pittsford, Seneca Falls, and Watkins Glen, among others. A ceremonial last leg of the trip by land concludes in Corning with a community-wide celebration on September 22. In total, GlassBarge will travel to nearly 30 cities and towns, offering glassblowing demonstrations at each port. A full summer schedule is available at www.cmog.org/GlassBarge. 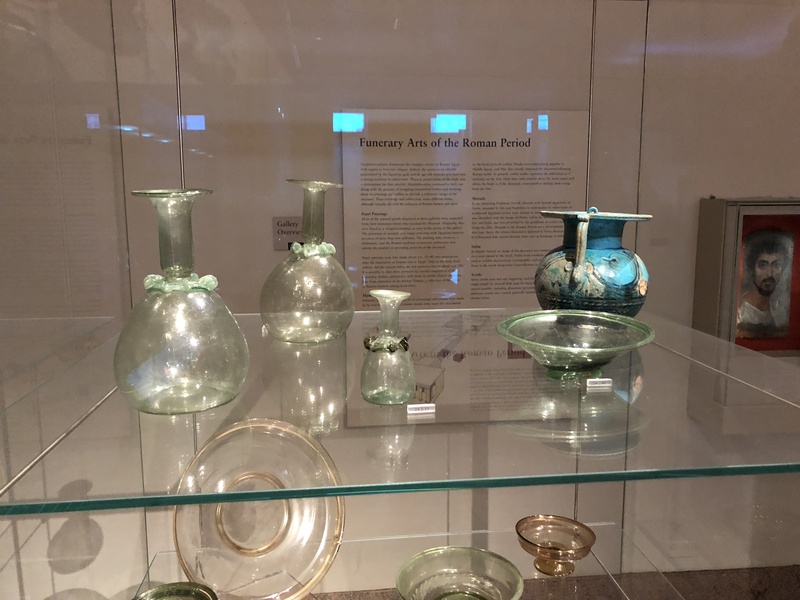 The GlassBarge journey is also being celebrated in Corning with a reinstallation of the Crystal City Gallery, which also commemorates the 150th anniversary of glassmaking in Corning. 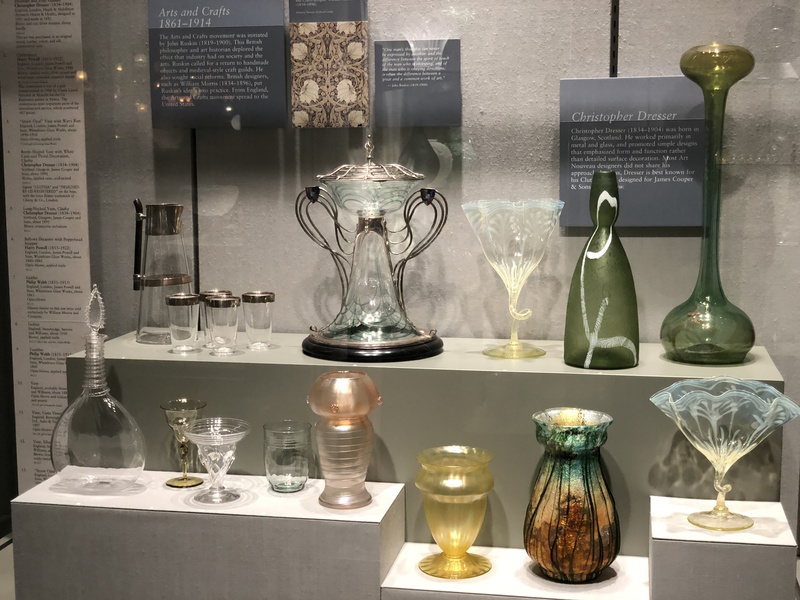 The narratives explored in the Crystal City Gallery tell how the city became one of the premier centers for glass cutting in the United States, a trend in American luxury glass that developed as the Corning Glass Works was becoming established in its new home. 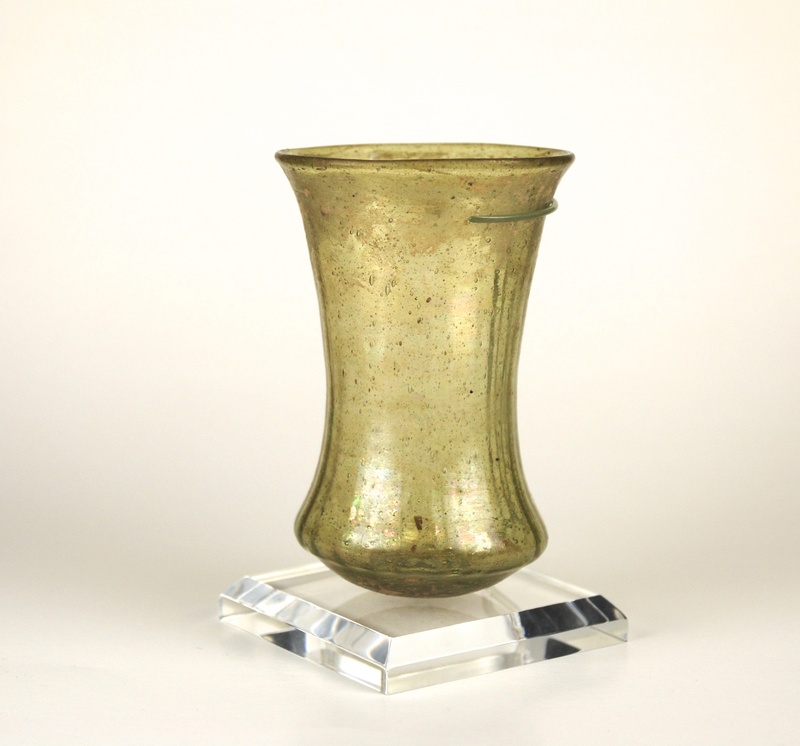 Remark:The natural colored blue-green glass used on this delicate pitcher has virtually no weathered and appears as it would have looked just after being manufactured in the First Century. The simple ovoid body is accented by a ring base. The precise handle is beautifully executed with thin ribs and double fold-over at the mouth.